Allah has not made for a human being two hearts (but one) in his interior. Allah knows well the (secrets) of (all) hearts. Lo! therein are revelations for each steadfast, thankful (heart). Welcome to the 3rd Edition of Sufi Poetry Carnival. Sufi tradition has given birth to some of the most prominent and celebrated poetry in human history. From the early companions of the Last Messenger, such as Ali ibn Abu Talib to contemporary Sufi Masters, there are many great poets who have come from this inspiring and living stream. The power and beauty of Sufi Path is so blazing that its echo is still present today, and a testimony of that is the fact that a Sufi Poet of 13th century (Rumi) is still the best selling poet in a land (United States of America) which for most part doesn't even understand his language nor his culture. This also speaks on behalf of the power of poetry, which can transcend many artificial boundaries and constructs. While poets are visionaries and seers, poetry can be, not only revelatory but also bridge-builders among hearts, cultures and traditions. The relation between Sufism and Poetry is inseparable. Sufi poetry has been written in many languages, with many intentions, including for private devotional writing and reading, as healing talisman and as lyrics for music played during sufi remembrance or dhikr. Sufi literature is deeply rooted in the Noble Quran. (While) the Quran is not poetry in tilt ordinary sense of the word; yet it is supreme poetry with its definite metres and prosody. The first commentary upon the Quran which is the Hadith, although very distinct in style from the Word of God, remains faithful in its poetic qualities, the use of aphorisms and symbolic imagery to the Divine Word. This is particularly true of the sacred hadīths which are so essential to the genesis and later development of Sufi literature. It is therefore not surprising that the earliest literary expressions of Sufism are in the form of aphorisms and short mystic utterances soon to be followed by poetry. The first example of these utterances are to be found in the Nahj al-bālagha of 'Alī ibn Abī Tālib, containing the sayings of the man who was the representative par excellence, after the Prophet of that reality which came to be known later as Sufism. From Mansur al-Hallāj poetry became the most intimate vessel for the expression of the truths of Sufism, of states and stations too subtle to be expressed in ordinary prose or the language of everyday life. Poetry has continued to serve as a vehicle for Sufism in other Islamic languages whether it be Urdu or Bengali to this day and the tradition of Sufi poetry remains a living one throughout the Islamic world despite the ravages of time and various forms of encroachment upon traditional modes of art and thought in the Islamic world in modern times. Dana Wilde in her article On Sufism and Poetry writes: "The general Sufi sense of what reality consists in is inherently poetic; it seems not only to parallel the cosmos that a poetic imagination, in the most general terms, conceives, but really seems to embody that version of reality. Poetry is an instrument of awakening and instruction. It is a way of opening the mind to the divine reality, a way of helping people to grow out of the visible into the realm of the invisible." 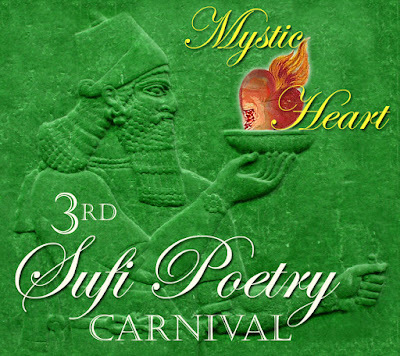 Following the rich tradition and living link between Sufi Path and poetic expressions of ecstatic hearts, Sufi Poetry Carnival is a small effort to welcome poets from all over the world, mostly through the medium of the internet to contribute. As a collective, this is a witness of contemporary poetry in Sufi genre, inspired by Sufic values / teachings / traditions. Many of the poets are also initiates of the living Sufi tradition. 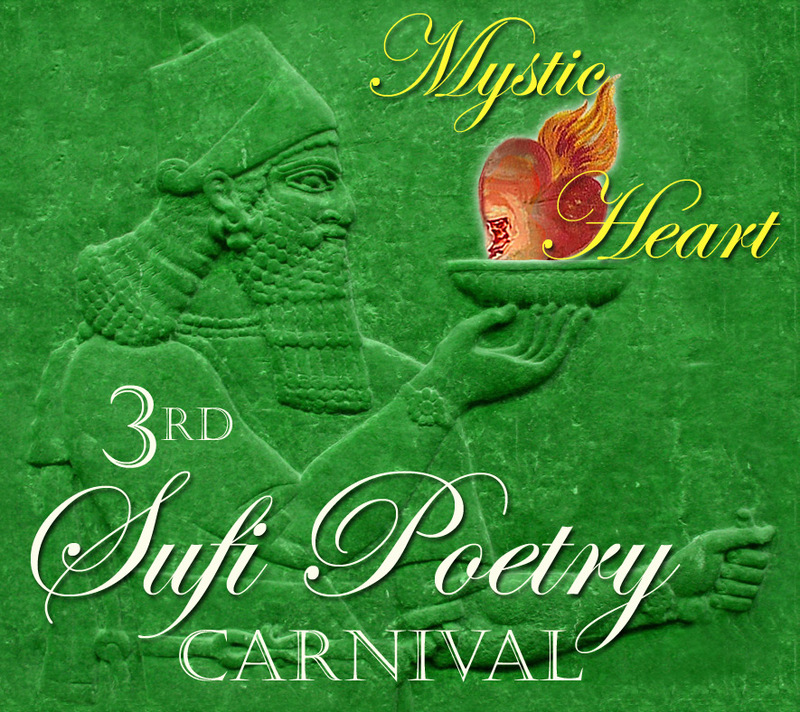 In each edition of the Sufi Poetry Carnival we pick a theme and this 3rd Edition's theme is: Mystic Heart. The Inner Heart is central to the Sufi Path and among many of the so called definitions of Sufism, it is "the path of polishing or purifying the mystic or inner heart". they are not separate and far from each other. but their light is mingled as it moves. has shot into this heart, know that there is love in that heart. there is no doubt that God has love for you. This edition of the Carnival is jointly hosted by Technology of the Heart and Darvish blog. We heartly thank all those who sent your entries to us. Below are the poems hosted on Technology of the Heart. Click on the title of each poem to read them. The poems are posted in no particular order. Bismillah. Rest of the poems is hosted at Darvish blog. Click here to read and enjoy them as well.